In this article I review the Patagonia Torrentshell rain jacket for men, a popular option from Patagonia. It's got a lot of very happy users so I wanted to take a closer look. A high performing jacket, very effective in terms of waterproof and breathable capability. It's a great looking rain jacket which although a bit on the higher end of times in price, is good value. The Patagonia Torrentshell men's rain jacket is another very popular rain jacket from Patagonia. 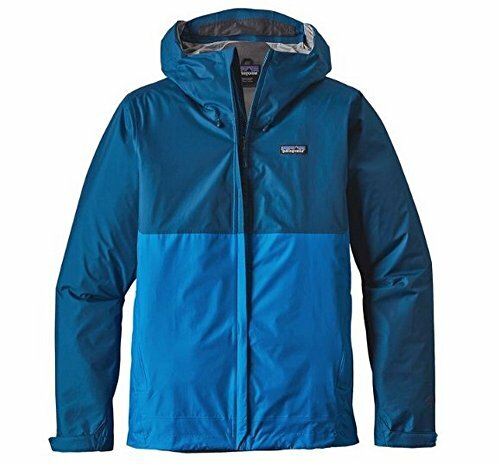 A tough 2.5 layer jacket made from 50D nylon ripstop, it's one of Patagonia's most popular jackets and there is a lot of good user experience across the web on it. It's a functional and no nonsense rain jacket that falls into the medium range of the rain jacket category in terms of price, $100 to $130 approximately. It's an accessible rain jacket that, on initial review, looked a fine option for the trail. It falls into the best category for a hiking rain jacket in that it doesn't cost a fortune but is very functional and lightweight as you need performance and protection from the elements when you're out on the hills. It ticks most boxes I would want it to with regards to performance so let's take a closer look at those in the sections below. The Torrentshell is waterproof with a rating of 20,000 mm. Now, that's a pretty high Rating, second from the top of the scale in fact. A jacket with this rating means it is rainproof and waterproof under high pressure so the Torrentshell should be well able to cope with heavy rain, wet snow and some pressure. If you're not familiar with how the rating works, the 20,000 mm refers to the water column test. If you put a square tube with inner dimensions of 1” x 1” over a piece of fabric from the jacket, you could fill it with water to a height of 20,000 mm (65.6 feet) before any water would start to leak through. The jacket has fully taped seams to ensure there are no leakages where layers of fabric and features connect with each other. The Torrentshell also has DWR treated zippers and the jacket is treated with Patgonia's Deluge DWR finish on the outside. This DWR finish beads water off to further enhance the waterproof protection it offers. What can you take from this? Well, the Torrentshell is very waterproof and able to take a fair old pounding from the elements while protecting you in the process. Pretty sweet in terms of hiking as you need good protection in the Great Outdoors. From my extensive look across user reviews, overall, the Torrentshell lives up to it's promises and performs very well under tough conditions. Also from those reviews I noted that the hood works very well in terms of keeping the nasty weather out. It has a stiff brim that can be tightened via an elastic cord in the hood itself. This works well in combination with another cord on the back of the hood to adjust the brow. The waist of the jacket is a good length down and the Velcro cuffs work well. The hood, length and cuffs all combine to make the jacket very functional in the water resistance department. The Torrentshell is listed as having Patagonia's H2NO performance standard shell fabric which is fully waterproof, windproof and breathable which we'll look at next. In summary, you can expect strong rain protection from the Torrentshell. For breathability, the Torrentshell utilizes Patagonia's H2No membrane 2.5-layer construction. 2.5 layer construction is the standard for modern rain shell jackets and works pretty well for the price you pay. Breathability prevents steam from building up inside the jacket in rain showers while you're pushing yourself. The breathability of the jacket enables you to stay at a reasonable temperature as you hike or perform any activity where you push yourself. In terms of performance in the breathability category the Torrentshell performs pretty good from the many user reviews I checked out. The breathability of the Torrentshell is further enhanced by pit zips, as shown in the photo above, which when opened provide a generous ventilation area under the arms. The cuffs can also be loosened for some extra ventilation but the hand pockets are fully waterproof i.e. no mesh ventilation in them so there is no breathability access via that channel. This quick access ventilation is a very good thing to have in my opinion. If you're exerting yourself on the trail in wet and rainy conditions, it is nice to be able to have a quick and easy way to cool down faster should you wish to. Even in terms of staying hydrated this type of thing is important, you want to be able to quickly regulate the internal heat so you sweat less. Pit zips are great for helping with this. In the comfort department, the Torrentshell rain jacket for men is very functional. By that I mean, it is a real 'does what it says on the tin' kind of jacket. Nothing too fancy but it performs well which is the most important thing. From the reviews I read, a lot of positive feedback came about the fit and feel of the jacket. The hood fits very well and when it is fully in position, it stays put. This is a great thing to have in a jacket. I have had the experience of having a hood that seemed to have a life of it's own, especially in very bad weather. If you can get a hood that will stay in the position you have adjusted it into, in tough conditions, you're onto a winner. Keeps the line of sight good and distractions on your face from the elements at a minimum. There is plenty of room for a helmet in the hood too which is always good to have should you take your hiking adventures that bit further. The other big point of note from user reviews, in terms of fit, was that the Torrentshell fits very well in the Torso area. As mentioned above, it is a good length and it is such that you can extend your arms upward and again, the jacket stays in position. So, in summary, if you're scrambling up over rocks on the trail with a backpack on, you won't have to worry about your jacket taking on a life of it's own and exposing your body as it moves into all sorts of positions. For hiking, you need to be able to layer your clothes underneath your jacket and there will be no issues with that using the Torrentshell. Many folks said the jacket fitted well and it was comfortable with multiple layers. In terms of sizing, the broad consensus is that the Torrentshell fits true to size so no complications when buying it online or that, just go with your normal size and you should be good. Aside from that, there are no other fancy features to talk about. No brushed chin guard lining, chest pockets or the like. That's OK though as the functionality of the Torrentshell comes up trumps and that, after all, is our main concern. As mentioned already, the Torrentshell men's rain jacket utilizes Patagonia's H2No membrane 2.5-layer construction using a 50D nylon ripstop. 50D is at the top of the tough end of the range amongst the rain shell jackets I review on this site. As a brief explanation, ripstop fabrics are fabrics that are woven using a special reinforcing technique. This technique makes them very resistant to tearing and ripping. D = Denier is a unit of measure for the linear mass density of fibers. It is defined as the mass in grams per 9,000 meters. In lay mans terms, think of it as thread size. 50D is tough and so the Torrentshell has a tough and durable construction. The Torrentshell is stowable in it's own hand pocket and there is a clip in loop so it can be easily packed away securely in your pack. All in all, the Torrentshell scores from above average to very well in all of these categories. As mentioned above, in terms of features, the Torrentshell doesn't go crazy. It offers what you need and not too much more but that's all good in my opinion. We touched on the hood above in the waterproof section. By all user accounts I read, the hood performs very well and is very adjustable with the three loops and pulls on it, two on the sides and one on the hood itself. The only downside I came across was that these loops and pulls can be very fiddly to adjust, especially with heavier gloves on. The hood also has a stiff brim which I am a big fan of and again, by all accounts, it performs well in the field. The hood is also stowable into a snap closure, see photo above, for rolling the hood in and stowing it away while wearing the jacket. The cuffs, pictured above, are adjustable via a Velcro strap which again works quite well in combination with the other adjustment features on the jacket to enable you to create a comfortable protective shell to protect you from the nasty stuff outside. the Torrentshell has 2 standard zippered hip pockets and, as mentioned above, the jacket packs up into one of them. It's worth mentioning that the pockets on the Torrentshell are not mesh and are instead fully waterproof. Therefore you can store some bits and pieces in them and they will stay dry while still having easy access to them. The Patagonia Torrentshell Jacket for men is a very functional jacket that performs very well in tough conditions. For that, I think it is very fairly priced and it sits roughly in the middle of the price range for a rain shell jacket. However, as with everything, if you shop around, you should be able to get a bargain. Click on any of the links in this review to check the live price on Amazon. In summary, the Torrentshell will cover the needs of nearly all hikers and is very accessible at the price it's listed at. The Torrentshell is a true all-rounder when it comes to the outdoors. Of course we're primarily interested in hiking and it is perfect for that. It is also great for any backpacking trip or any other kind of mountaineering activity as well. You will definitely get 3 season use on the trail out of it but possibly 4 depending on where you're hiking of course. The Torrentshell is also perfect for day-to-day use too so it will keep you dry while out buying your groceries or walking your dog too. It performs well against its peers and you can do a lot worse than adding the Torrentshell to your pack for a day on the trail. As of the date of this post, from about 120 reviews we totaled across five retailers, 58% of people gave the Patagonia Torrentshell 5 stars and 86% 4 stars or more. They're very good scores for sure! Loose fit leaves plenty of room for layering underneath. I think the Torrentshell Patagonia jacket for men is a really good rain shell jacket for the trail as well as for normal everyday use. It's great value at the price and there is a lot of very positive user experience with it across the board. If you're in the market for a rain shell jacket, you could do a lot worse than getting your hands on one. If you like the look of it, you should put it on your review list and definitely click on the links above to read some more of the user experiences with it! If you're still not sure what jacket you want, check out the 10 best hiking rain jackets for men, where we list out the best men's hiking rain jacket options. Have you ever had a Patagonia Torrentshell Jacket? What’s your experience with it? I’d love to hear about it in the comments below! One of the most comprehensive review’s on this jacket. Great work. Hey Kelvin, thanks for that, glad you found it useful!